Copper and Rose Gold are definitely a trend of the moment, and I'm all about joining in on that. All of these items above make great statement pieces to really stand out in a room. I have that lamp on my bedside tables, and I would love to get that little deco house for my entryway table. I also have that beautiful print from Hunting for George but not in the copper foil, just in black, though it is still magnificent! 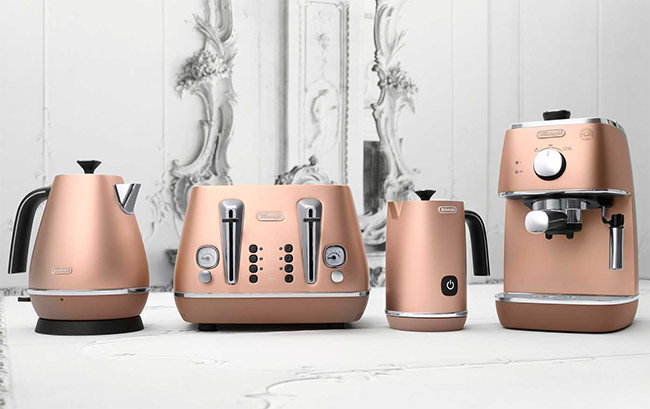 To this beautiful new range by Delonghi, the Distinta Breakfast Collection. My partner and I spotted these in stores yesterday and wow, aren't they something! Have you bought anything in copper or rose gold for your house? These accent pieces won't quickly go out of style. I love that kitchen set and the metallic print, super cute! And that bed frame is divine! Not gonna lie, I didn't know that copper was a trend, but I'd be very okay if it stuck around for a while! I love the look of copper accents! The basket and lamp are my favourite from your collage, it makes me wish I had my own place to decorate. I'm loving copper lately, love all of these and want them all! I'm literally in love with the look of copper accents inside a house, it maks me want to have my own place and just decorate it! My favourite thing though is the kitchen set, the colou of the items makes them look soooo amazing! This color is beautiful my mom collects everything for kitchen in this color. I'm all on the copper train! Copper kitcheware is a thing?! I totally forgot, but now I must have it! Absolutely loving the copper trend for in house, especially those wired lamps - they look so cool! I'm loving copper too - there's something so rustic yet modern about it. Great picks, especially love the deco house! Wow I love the breakfast collection!!! If I had my own place they would definitely be in my kitchen! 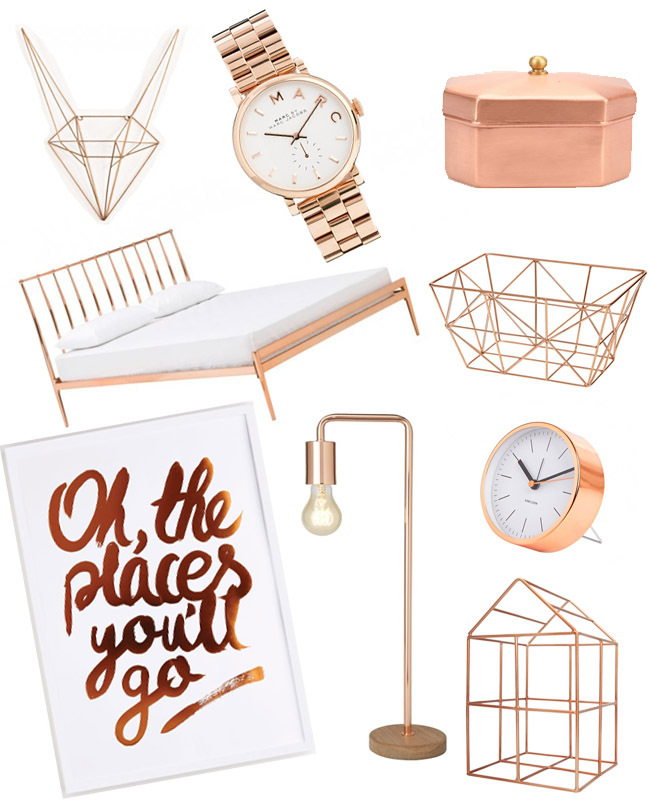 I love the copper homeware trend! My boyfriend decorates his place and I'm sure he'd love the table lamp and the deco house! I think perhaps you'd only need one or two of those things.. if you had all of them it might be a bit excessive? I just adore the copper trend, in term of home decor as well as jewellery, I'm just crazy about it! I picked up a copper money box last week and my room feels instantly more glamourous! I just have to make sure I dont go overboard.